I improvised this pasta dish tonight out of ingredients in my fridge and pantry that I needed to use up. Despite the wacky mix of ingredients, it actually tastes delicious! First I sautéed 4 cloves of garlic, 1 shallot, and 4 scallions in plenty of olive oil, seasoning with some herbes de Provence, freshly ground black pepper, and dried kombu and shiitake-laced sea salt (similar to the Breakaway Cook’s umami salt, but minus the Parmesan). Then added a bunch of white Swiss chard, sliced into ribbons, a handful of chopped walnuts, and a roughly chopped Fuji apple. Then I added in a few splashes of 100% pure apple cider from the farmers market and a heaping spoonful of organic white miso. I let the mixture braise on low heat for a bit until the greens wilted. Meanwhile, I cooked up the whole wheat penne pasta. 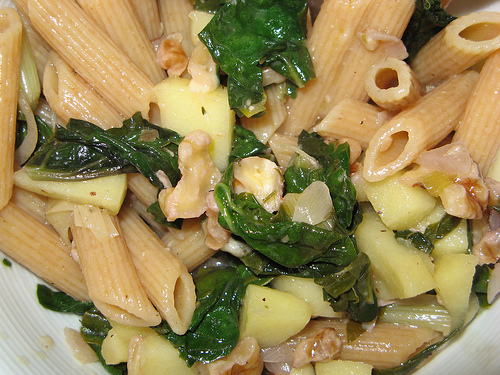 I used the apple and chard mixture to dress the pasta, adding a bit more olive oil, and topping things off with some grated Gruyère cheese and more freshly ground black pepper.